The Thermage CPT system offers a possibly safe and effective way to tighten the skin and its underlying areas safely with little to no downtime. Introduced by the Thermage company, Thermage CPT is the only FDA approved non-invasive and non-damaging system to use radiofrequency heating combined with external cooling. 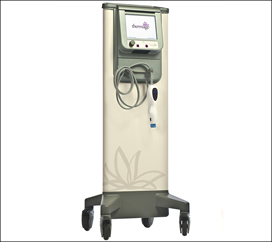 Thermage CPT can give immediate and long-term improvement to common imperfections such as sagging skin and facial lines. The simple procedure takes about an hour and is performed at your doctor's office with either topical anesthesia or light sedation. Radio frequency is applied to the skin, with the energy converted into a uniform, sustained deep tissue heat under the skin. As the collagen rebuilds, the skin and underlying structures can tighten and smooth out wrinkles and loose skin. Most patients are able to return to normal activities the following day. A small percentage experience mild swelling and bruising, which will resolve within seven to ten days. Thermage CPT can also be performed with other procedures such as chemical peels and Restylane treatments, and fat transfer. Is Thermage CPT right for me? While almost everyone can benefit from the Thermage system, it is especially suited to if you have a darker complexion, if you're not a candidate for conventional facelift surgery, and if you scar easily. The best areas to treat are the face and neck, though the arms, legs, breast, thigh, and abdominal areas can also benefit. These areas may, however, require multiple treatments. While you may notice tightening of your skin following the Thermage treatment, additional tightening usually occurs over time. Cosmetic surgeons have reported that results may last 36 months or more, depending on the patient's natural aging process. Some of Dr. Rahimi's previous patients still have excellent, long-lasting results more than three years after the procedure. Individual results may vary, consult your doctor to make sure you are a good candidate for this treatment.